Did You Visit Peru EcoCamp? Let Peru EcoCamp know why they're great—and if there's anything else you'd like from them. May we share your email address with Peru EcoCamp please? Thank you! We'll pass your feedback along to Peru Eco Camp and we may feature your kind comments on Kynder! Peru EcoCamp offers the first private sustainable luxury glamping experience that will bring you in close contact with Andean culture thanks to experienced guides. Their ecological adventures will take you hiking along the Salkantay trail, across pristine mountainsides while sighting condors, passing Glacial Lakes like Humantay, visiting picturesque villages, and ancient Inca citadels like Machu Picchu. 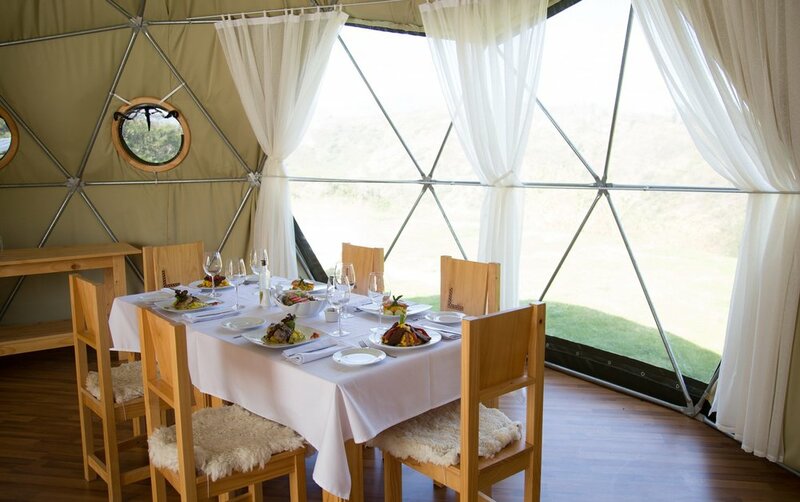 Enjoy a gourmet dining experience in accord to each ecocamps altitude, prepared with local, fresh and organic ingredients. Eco-friendly and wellness activities include hiking, horseback riding, cooking classes and yoga. Camps contain all the facilities needed to reduce wearing down, destruction and pollution of the routes. All guides are protected and thrive. They prioritize concern for the environment coupled with eco-friendly development that is sustainable over time. They strive to promote skill building and job creation initiatives for the local communities who form a precious part of the Peru EcoCamp family. "Our socially responsible, adventurous trekking tours for the upscale traveler are the first of their kind in the Andean region of Peru." Organic products and process: To grow vegetables, they use organic fertilizers and compost produced by the waste of fruits and vegetables from the kitchen. Camps are powered by solar energy and water turbine systems. Water is filtered and treated with UV light so it is safe to drink the tap water, reducing the use of plastic bottles. Liquid waste is filtered and then goes back into the ground. Whole waste goes into a container with a biodegradable system and once a year, this container is emptied, with the compost is used for reforestation. Kitchens and bathrooms use organic, non-detergent products. Promote ridesharing and/or public transportation. Analyze social/environmental impact of business investments. Fair labor values including full minimum hourly wage for both tipped and non-tipped staff. Living/fair wage and/or above minimum wage. Health care option for hourly employees. Transparency in tipping for staff and guests. Paid sick days (or time off in lieu) for hourly employees. Advance scheduling for all employees (at least two weeks in advance). Protect and empower migrant workers. All domes are 28m2/300 ft2 and include either a king-size bed or 2 twin beds. Fully equipped with a private bathroom (toilet, sink, & a hydromassage shower). Wood burning stove and enough blankets to keep you warm. Dinner and drinks are served in the dining dome or in their lobby/bar dome. Family friendly (over the age of 7, accompanied by an adult). Each trekking tour group will have a maximum of 14 people. They maintain a ratio of six guests to one guide. If there are 7 or more trekkers there will be two guides accompanying the group. All guides are educated in the field of tourism and have also received first aid assistance and are fluent in English. They also have guides who offer tours in Spanish, German, French, Italian, and Portuguese. All guides have excellent knowledge about local flora and fauna as well as Peru's history, geography and culture. Traveling at higher altitude requires a good level of general fitness. Their published tour itineraries include the hours trekked each day and the approximate altitude. As preparation, they strongly recommend arriving in Cusco at least two or three days before the tour to acclimate to the higher altitude. Before beginning the Salkantay Trek, they expect guests to be fully honest and aware of their own health and fitness levels. You will be asked to complete a Medical Disclosure Form as well as a Release of Liability and Assumption of All Risk Document. The Peru EcoCamp Full Experience Tour allows guests the comfort of an airport pick up as well as hotel arrangements in Cusco before and after the Salkantay Trek: a glamping trek from the Mollepata valley around Mount Salkantay ending at the legendary city of Machu Picchu. This sacred citadel and world wonder has been fascinating and enchanting visitors for more than a century. It is a portal to the past and a step into the incredible history of the rise and fall of the Incas, the most advanced civilization of the Americas. The Salkantay Trek to Machu Picchu, including Mount Salkantay and Humantay Glacial Lake, is the most varied, complete and best selling program! The Salkantay Trek to Machu Picchu is one of the world’s 25 best treks. Experience the rich geography of the Andes as you hike remote ancient trails where enormous snowcapped mountains give way to lavish forests of tropical fruits and unique orchids. The site of Choquequirao “Cradle of Gold,” considered as the “Lost City of the Incas,” as the Inka Rebels’ last refuge. For this alternative Inka trail, it is necessary to be in good shape, as the walk is classified as CHALLENGING, including steep climbs, long descents, and high mountain passes over 4600 m/ 15091 ft.
Watch the condors fly, hike up to Mount Salkantay and take the panoramic train to Inca Citadel Machu Picchu. The program entails 5 days and 4 nights in their luxurious domes. The Peru Ecocamp Experience Tour is for the nature lover who wants to enjoy breathtaking geography, staying at luxurious ecocamps for a true glamping experience. You will observe the flight of the Condor, behold the majesty of the sacred Salkantay and Humantay mountains, and visit a glacial Lake and the Salkantay Pass at 4,664m/15,300ft. 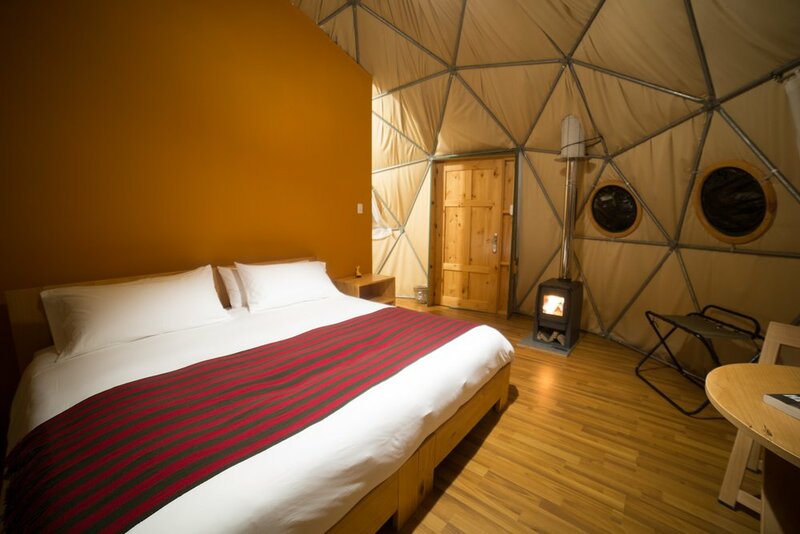 The EcoCamp Getaway is for the adventurous traveler who wants to enjoy the breathtaking Peruvian Andes while staying at thier luxurious ecocamps for a true glamping experience. Contemplate the majesty of the sacred Salkantay and Humantay mountains and visit the glacial Lake Humantay at 4,298 m / 14,100 ft. The Flight of the Condor & Glacial Lake Humantay tour was designed with the nature lover in mind. It features easy to moderate walks combined with comfort and relaxation at the luxurious Pincopata Ecocamp. The Flight of the Condor & Birding program is a must for all nature and bird lovers. It provides great opportunities for spotting the enormous Andean Condor soaring over the Apurimac Canyon. You will be able to encounter many endemic species on this trip, including the Apurimac and Vilcabamba Tapaculos, Koepcke’s Screech Owls and Forest Divers. An ideal alternative for travelers with a huge interest and awareness in nature but little time. Hike to the turquoise Humantay Lake or Glacier in just one day along their private route. Beautiful valleys and the charm of the Andes await you, and of course, the calm waters of the Humantay lagoon with views of snow and sacred apus, Humantay and Salkantay. TOUR RATES: From $250 for a one day tour to $3995 for the full 9 day experience.